How else would one "place" a real stuffed horse? Who would want one? Talk about a niche audience -- and the ad copy is not exactly compelling sales copy. Equestrian art collectors: museum quality life size horse! 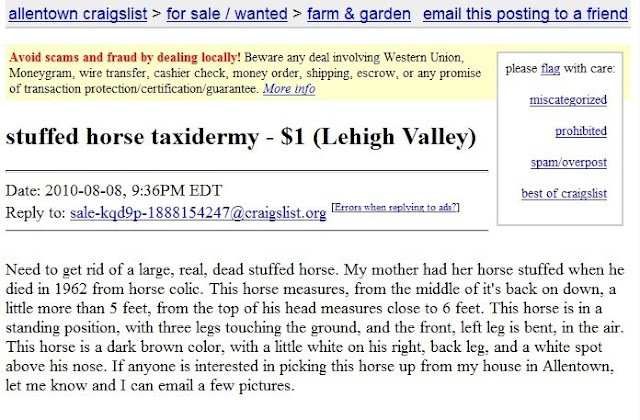 Seize this rare opportunity to own this vintage equine specimen -- a real horse skillfully preserved by a Lehigh Valley PA taxidermist in 1962. 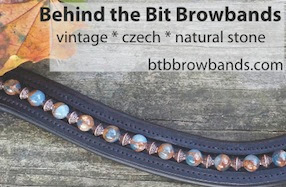 This unique object d'art could be the high-impact centerpiece of the equine collector's home -- a great investment and a true conversation piece! The horse is a chestnut with distinctive white markings, standing full six feet tall from head to ground. In positioning the horse, the craftsman/taxidermist captures the moment when the animal is poised for action, with three hooves on the ground and one raised as if prepared to canter away. The history of the piece is that this horse was a beloved family pet that died tragically and was preserved at great expense to the owners. Stuffed horses have sold to museums and other collectors for tens of thousands of dollars, and Trigger (Roy Rogers horse) sold for over 250K. Don't miss this opportunity to own this artistic and historic piece. Offers over 5K will be considered. A stuffed horse that is not a celebrity horse is just a stuffed horse. I visualise it's new life tacked up in cowboy themed restaurant. I wonder how much it cost his mother to have it preserved? (Everytime I've had to put down one of my horses, I clipped a big hank of tail hair foir a keepsake. Once I've bought a horse or pony, it's with me for life.) If I ever go to Victoria Australia, I'll go see Phar Lap on display at the Victoria Museum! A friend of mine had her beloved cat's skeleton made into a mobile, and the pelt preserved. She'd had the cat since childhood. She kept the pelt over the back of her sofa. People thought she was weird to do it, but whenever I went to her house I'd pet the pelt and say "Hi, Punky." She thought I was a little strange to do that! The skeleton mobile was interesting to see, but I liked the idea of saving the pelt more. Seriously? I think you should contact the seller and offer them your ad copy in exchange for a commission on the sale. Oh my goodness, I think I may have ridden that horse today. Either that or my horse needs more oats. You win first prize for weirdest story of the day. 7msn beat me to it. Send it to them! Gah, the things you can find on Craigslist!! Unreal! I think the American Pickers on TV bought a stuffed mini horse for just under a thousand and later sold it for three.....my figures may be off, but I was a bit surprised that it had any value at all. Trouble is it's not easy to sell something like that unless you take the time to find the right market. That's the tricky part. Anyway, it seems like a great object for showing off saddles in a tack shop, potentially. Like the clothing shop here that had one of those creepy Real Dolls. I agree. No matter how disgusting it seems, it must have some value. I would contact him with the ad if I were you and ask for a commission. Maybe he should try to contact local natural history museums. this definitely falls under the category "you just cant make this sutff up!" Well except for a good pitch that is. Good sales pitch - I'd almost buy it! I bet you could sell sand in the desert. sell my house for me. A stuffed *dead* horse. I'm glad the craigs list poster made that distinction, because, dayum, otherwise it would really hurt.